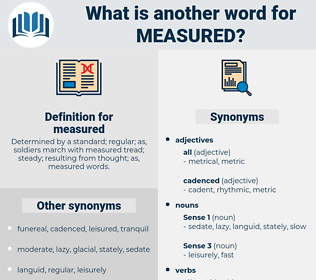 What is another word for measured? Determined by a standard; regular; as, soldiers march with measured tread; steady; resulting from thought; as, measured words. calculated, Measures, restrained, measurable, considered, measurement, weighted, observed, balanced, Computed, metering, Assessed, well-balanced, measuring, moderated, prudent, thoughtful, modest, deliberate, commensurate. Concentrations, samples, data, Records, Studies, directions, Regulations, readings, Torques, patterns, results, levels, terms. Compared, characterized, Investigated, Scored, Examined, ruled, interpreted, detected, reported, per, statistics, used, identified, established, Amounted, Ranged, marked, studied, derived, Screened, Performed, Influenced, defined, Enabled, Reached, Weighed, Was, Were, selected, by, Stood, concluded, recognized, Dealt, Wore, totaled, Totalled, conducted, laid, found, focused, focussed, HIT, set, included, Provided, Allowed, fixed, committed, Counted, based, decided, Accounted, put, held, Looked, para, made, calculated, considered, Computed, Assessing, evaluate, evaluated, evaluating, Assessed. assured, structured, Compared, Discriminated, demonstrated, ascertained, overestimated, operationalized, illustrated, insured, suggested, Appraised, ensured, Surveyed, categorized, indicators, scrutinised, Approximated, assumed, Criteria, harmonised, understood, Explored, benchmarked, calibrated, Captured, acquired, regulated, Investigated, reassessed, Administered, quantified, Gauged, scaled, addressed, secured, Assimilated, pre-screened, Scored, quantifiable, situated, performance, underscored, sampled, Issued, analysis, discovered, valued, declared, Indicated, Generated, departure, stored, quantitated, accomplished, Examined, distance, Argued, difference, articulated, formulated, accumulated, empowered, i.e., documented, Constructed, Resulted, described, gathered, variable, ruled, treated, internalized, appreciated, expressed, coordinated, Extracted, Regarded, interpreted, shaped, Exercised, predicted, Communicated, adjusted, report, Comprised, detected, Adjudicated, relaxed, implemented, Translated, required, Indexed, revealed, predetermined, reported, checked, analysed, processed, forecast, Drafted, recalibrated, researched, uncovered, verified, classified, designated, desired, projected, perceived, statistics, accrued, used, acknowledged, Equated, analyzed, Denominated, confirmed, Tabulated, esteemed, facilitated, identified, subdued, located, cherished, guarded, expired, Undertaken, Titrated, recognised, effected, accessed, increased, established, reasoned, recourse, Manifested, reflected, Amounted, Arrived, grasped, Mentioned, Prosecuted, marked, impaired, reviewed, Prevented, studied, anticipated, proved, proven, related, pursued, composed, absorbed, registered, realised, guided, opposed, conditioned, Deemed, Reckoned, derived, Audited, governed, Introduced, condemned, e.g., Assayed, Supplied, permitted, organized, relieved, spoken, reminded, recovered, Submitted, sought, positioned, consumed, tracked, revalued, Mapped, Retrieved, assigned, raised, valuated, mm, Judged, Screened, prescribed, resolved, tempered, dosed, presented, retained, Performed, planned, ranked, Worked, Influenced, contained, outlined, defined, Achieved, digested, Met, Encountered, Enabled, Delivered, Compiled, evidenced, height, Reached, mated, satisfied, associated, collected, Subjected, attained, enforced, initiated, quantized, Contributed, noted, help, Helped, Weighed, produced, experienced, utilized, realized, maintained, Shown, showed, Viewed, Been, Obtained, Complied, remembered, priced, credited, seen, Quoted, selected, geared, disclosed, employed, faced, stated, spent, covered, highlighted, felt, embodied, stone, toned, earned, Likened, enlightened, granted, driven, noticed, concluded, recognized, Dealt, role, Pegged, Discussed, witnessed, executed, Deployed, totaled, Totalled, dumped, Carried, posed, linked, read, conducted, drawn, built, withheld, left, lifted, laid, engaged, handled, Challenged, found, Followed, return, vetted, deducted, completed, applied, focused, liked, Brought, welcomed, chosen, dictated, HIT, set, designed, diluted, dedicated, adapted, Awarded, included, Incurred, suited, Provided, charged, developed, voiced, Allowed, Flown, received, placed, fixed, Filed, committed, Counted, based, tabled, Gained, decided, listed, Accounted, obliged, paid, put, cast, needed, held, booked, kept, Entered, Believed, given, tried, aligned, Looked, bound, taken, won, thought, wanted, para, done, made, calculated, restrained, measurable, considered, weighted, observed, balanced, Computed, evaluated, Assessed, moderated. ill-advised, unrhythmical, voluminous, nebulous, spontaneous, purposeless, hulking, epic, cosmopolitan, whacking, undefined, escalated, incalculable, sweeping, haphazard, whole, innumerable, inclusive, indefinite, endless, unadvised, boundless, immeasurable, goodly, major, extensive, unqualified, super, impetuous, handsome, hasty, instinctive, impromptu, broad, measureless, hurried, plentiful, copious, unconsidered, hefty, Dimensionless, indeterminate, unrhythmic, expansive, grandiose, unreserved, vast, general, inexhaustible, universal, random, considerable, unfathomable, ample, desultory, king-size, countless, bulky, unbounded, large, expanded, global, chance, sudden, unintended, arrhythmic, hit-or-miss, jumbo, largish, bottomless, respectable, comprehensive, enlarged, rushed, unmeasured, plenitudinous, casual, aimless, inestimable, unstudied, oversize, limitless, unlimited, automatic, bumper, great, extemporaneous, sizable, big, abrupt, illimitable, infinite, substantial, vague. Here he belonged, and the very spring of the earth beneath his feet was repeated in the measured beating of his blood. They measured the distance between Cronidge and Moorsedge, the two houses, as for half an hour on horseback. measure out, masquerade, mansart, miscreate, majorette, Masorite, Mass card, makeready, monosaccharide, Massorete, megacardia, mccarthy, migrate, mozart, mansard, muskrat, macruridae, Masorete, maquisard, mugwort, Macaca Radiata, misread, Moss Hart, magritte, macrouridae, mazzard, moon carrot, mensurate, mouse-eared, majority, microdot, miniskirt, macerate.